Danielle, owner of Sassy Polish and Scrubs had posted info regarding a blogger discount at the beginning of the month, so I jumped on it and ordered 4 polishes from her; she was kind enough to throw in one extra for me! I am very excited to be opening Sassy Polish & Scrubs. 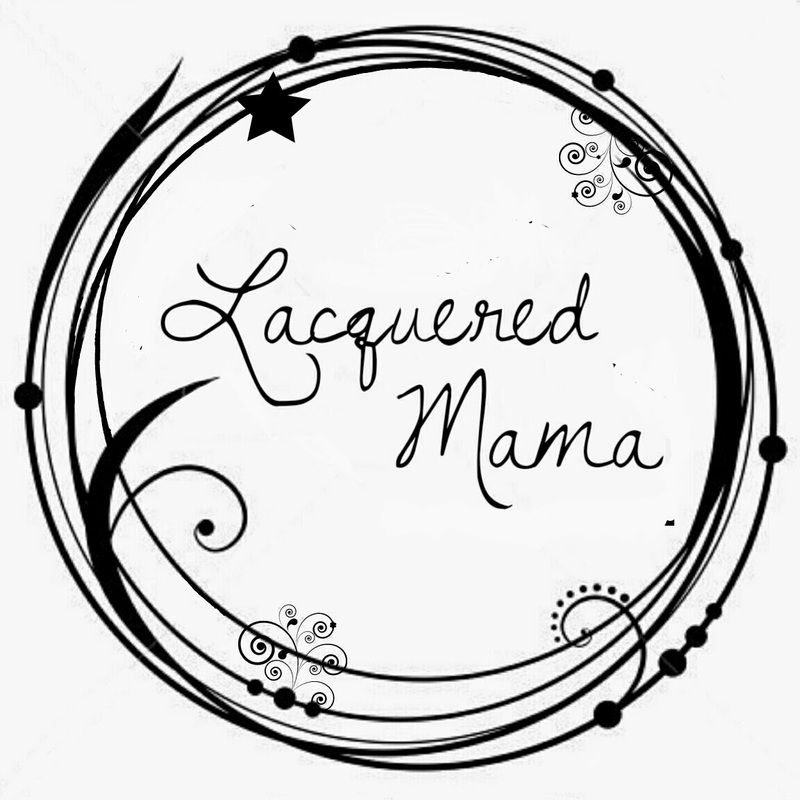 I will be offering homemade nail polish (mini and full size bottles) as well as yummy smelling body treats. 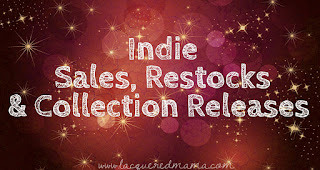 Sugar scrubs, bath salts, bath detoxes, and other goodies to leave you smelling your sweetest! First in the OITNB collection, I have Momma Russian. 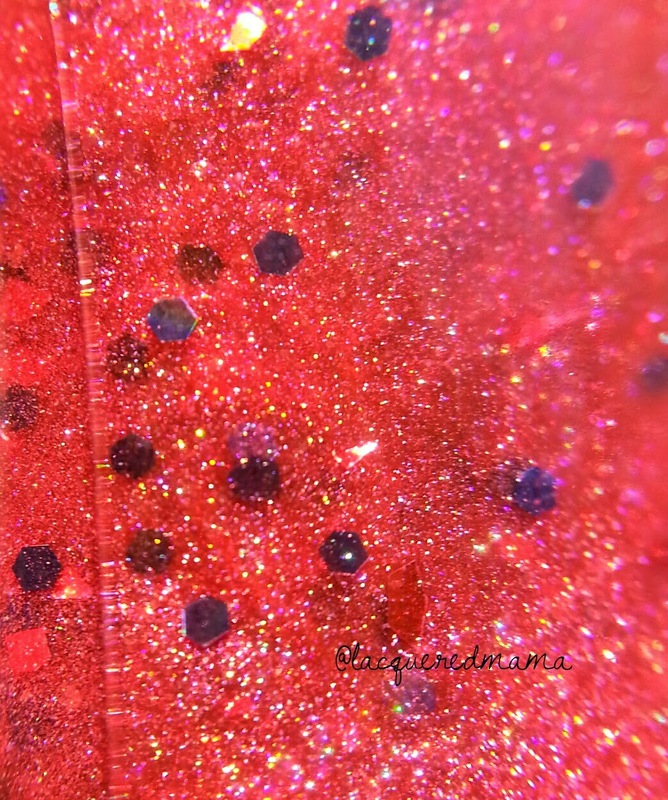 It's a red jelly with glittery linear holo and black and red glitters. 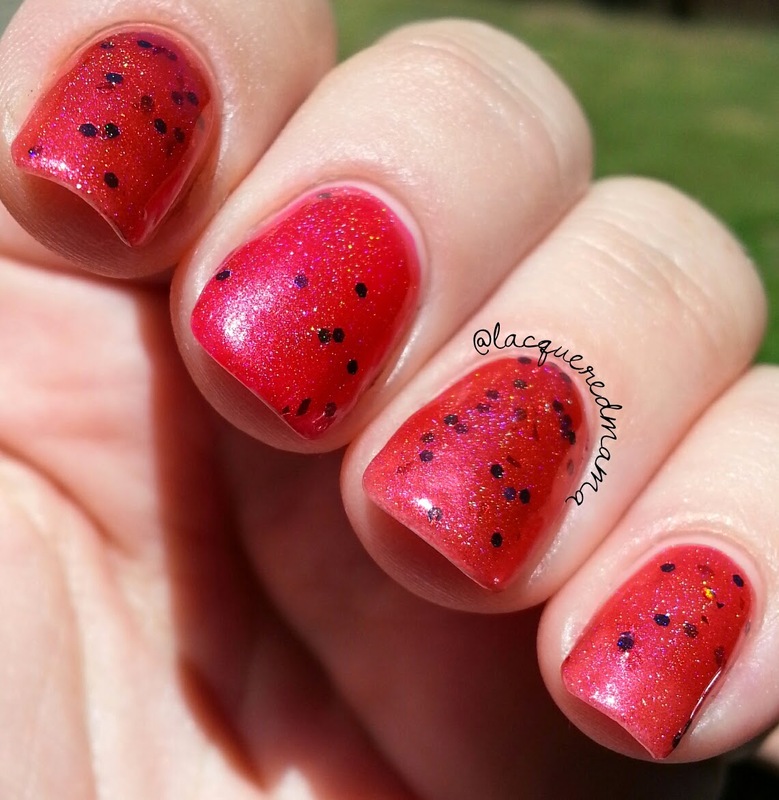 In my pictures I did 3 coats because it is a bit sheer and on my middle finger I put 1 coat over a base of Sinful Colors Go Go Girl (red). 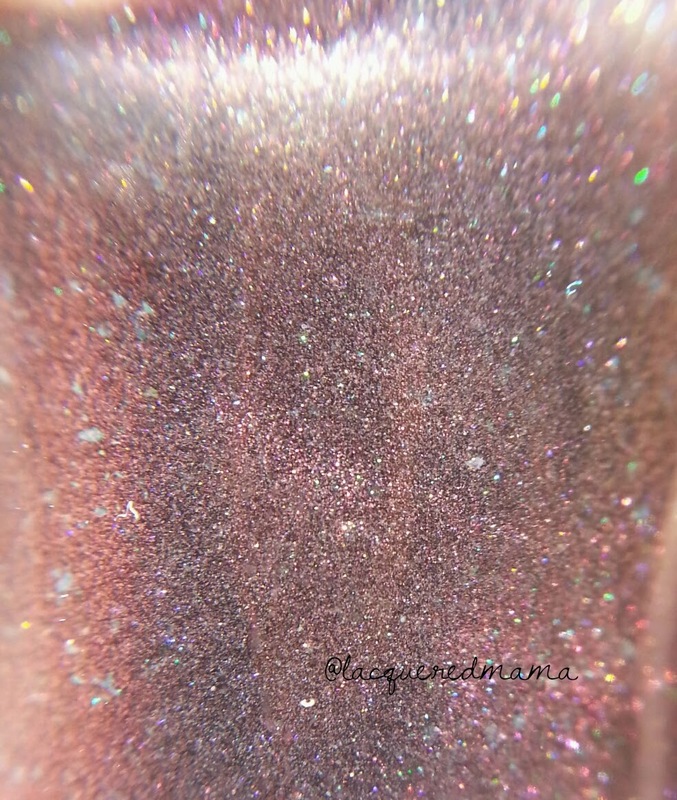 It had a great formula, not too thick or thin and I love the holo in it! 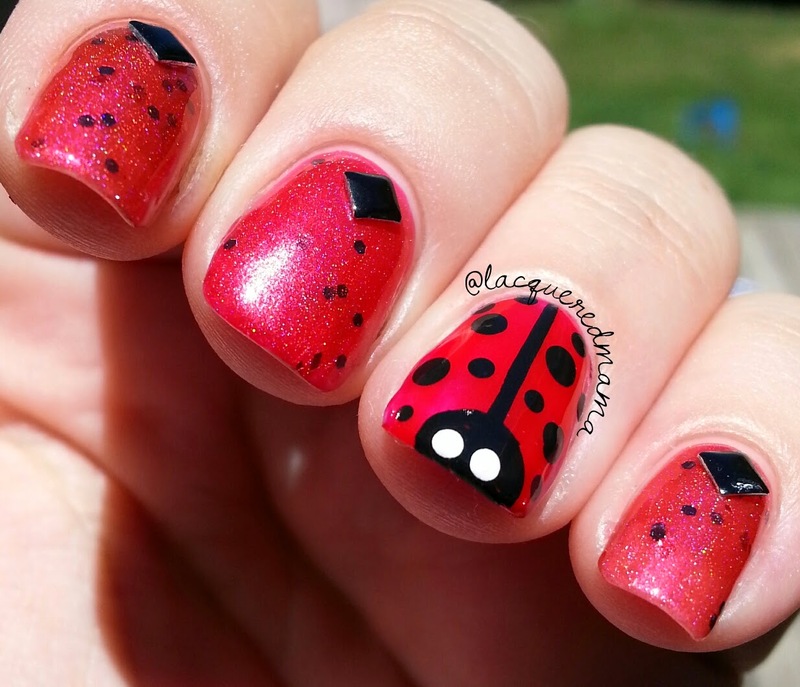 With the base being red and having some black glitters, it totally reminded me of a lady bug, so what did I do? I painted a lady bug of course! 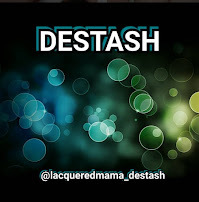 In the family of reds, I liked that this was sort of a darker pink red, as opposed to the blue reds. 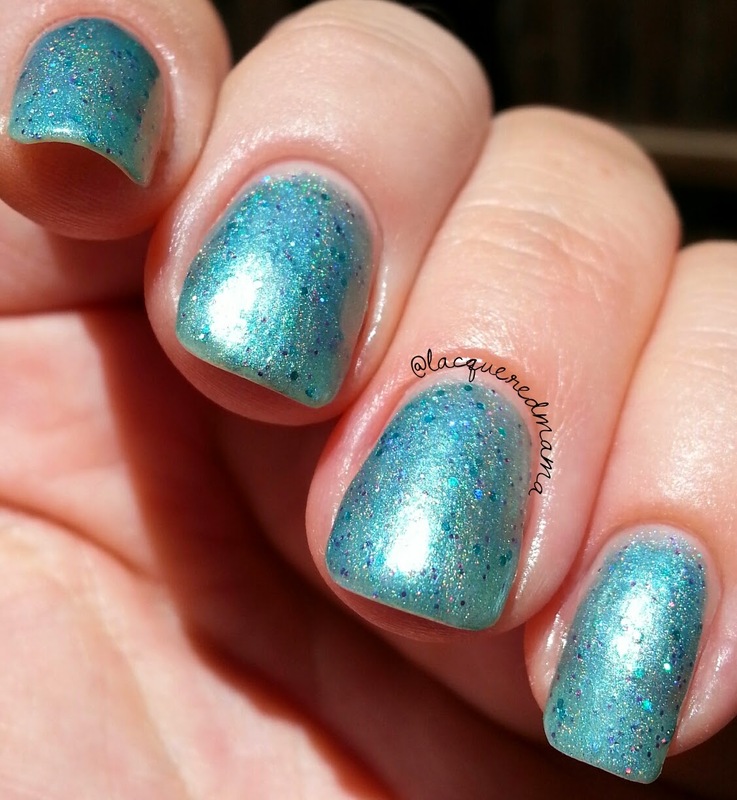 Great color for summer! Second in the OITNB collection is Crazy Eyes. 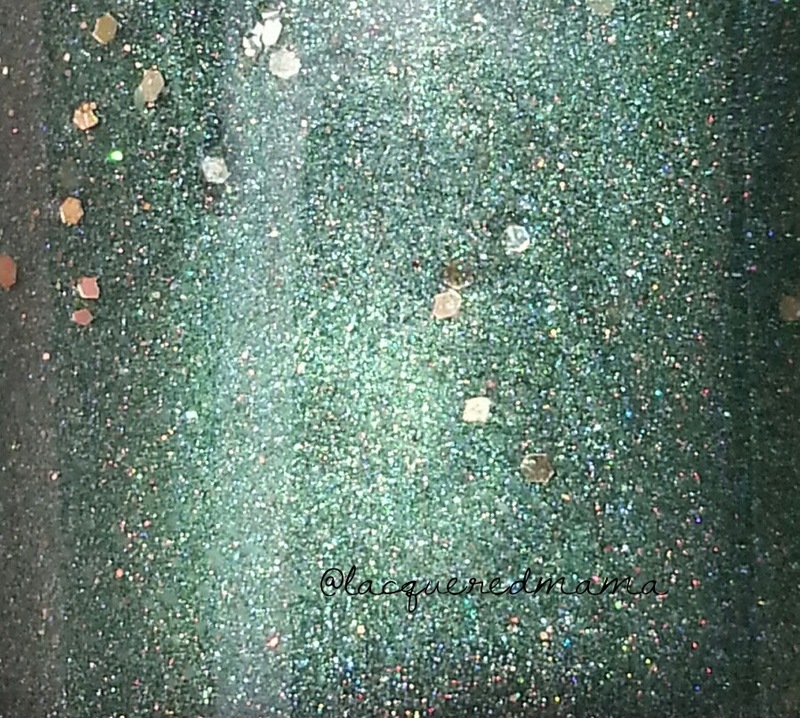 It is a glitter linear holo polish in a beautiful darkened plum jelly base with flecks of green glitters As much as I like this color, I must warn that is very sheer. It took between 4-5 coats to become even close to opaque for me. I'm not sure I would always wear this alone because of its sheerness, but I'm betting it would look great over a black base (of course I didn't think to do this at the time). 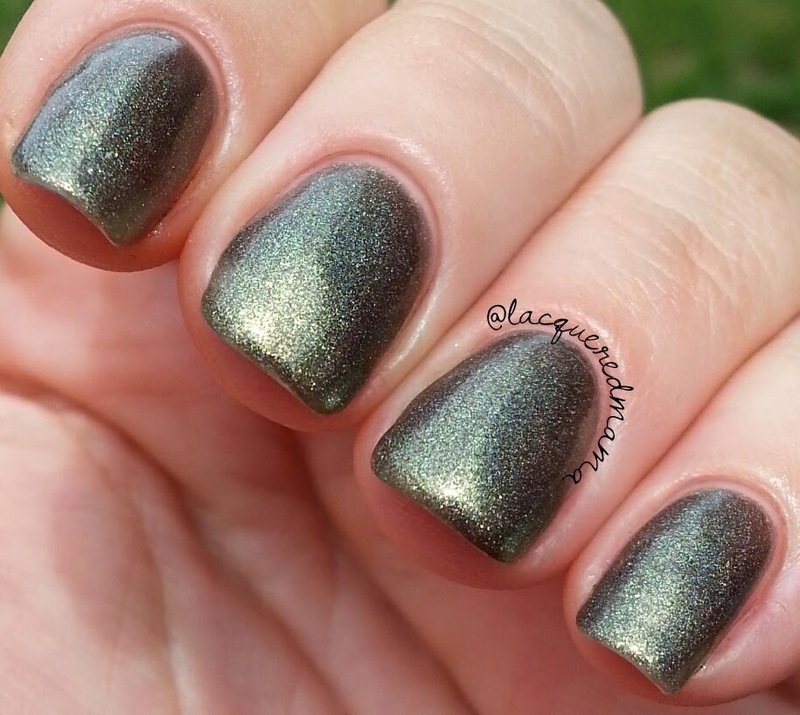 It also has a great color shift from the dark plum to an olive green tone. Very pretty. In my pics I did 4-5 coats plus topcoat. Thirdly in the OITNB collection is Larry or Alex?. 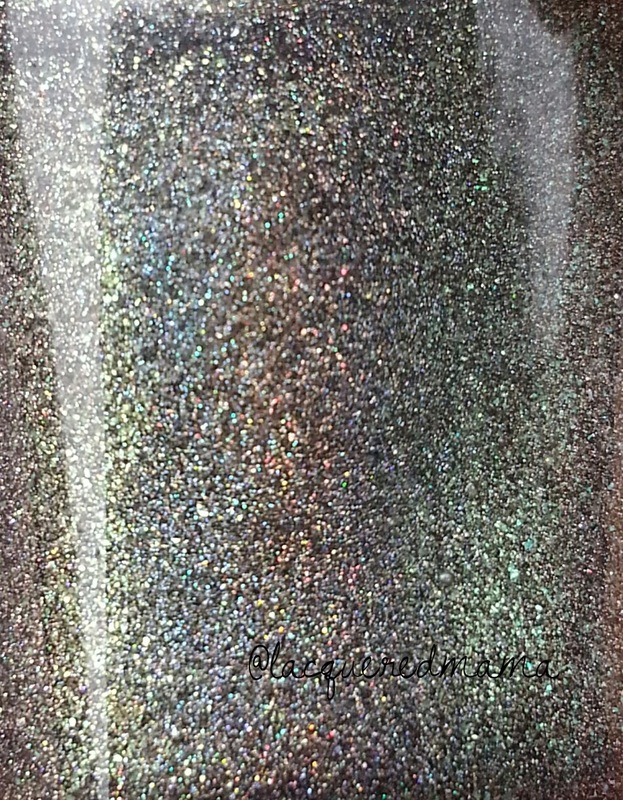 It is another glitter linear holo jelly. 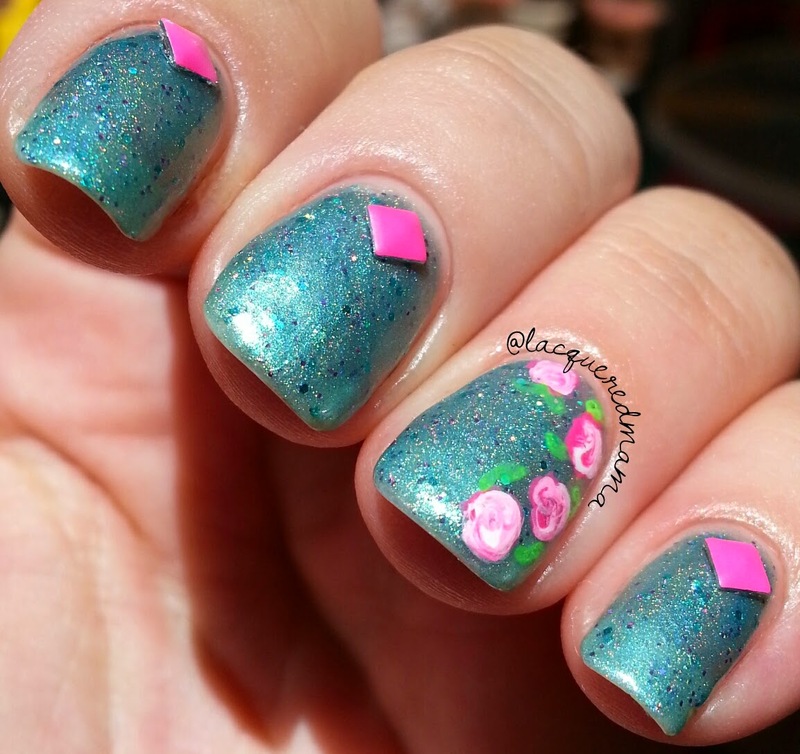 A really pretty teal loaded with teal and purpley holo glitters. Very pretty! 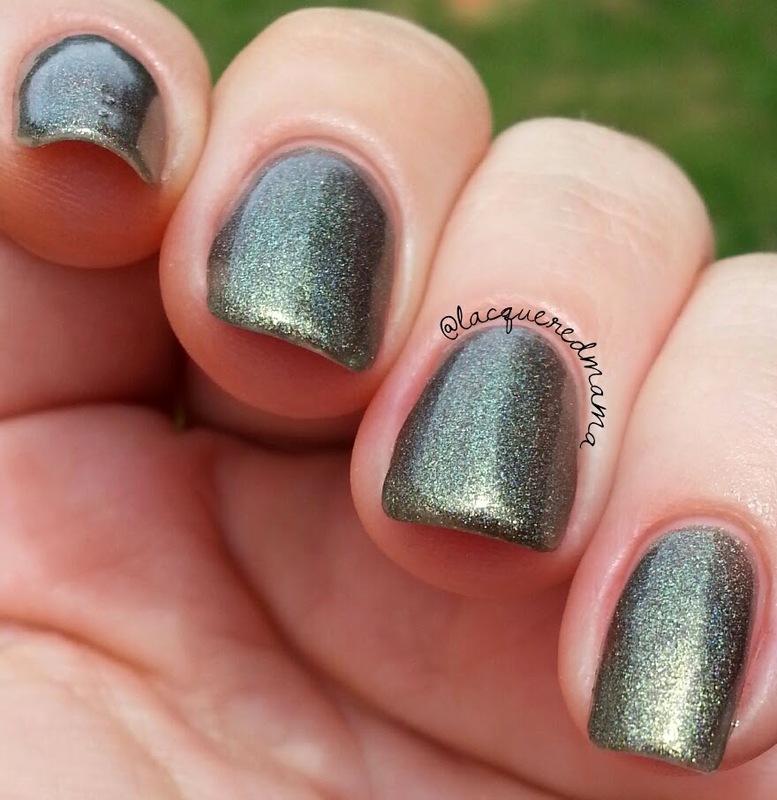 This one's formula was great and it was opaque in 3 coats. 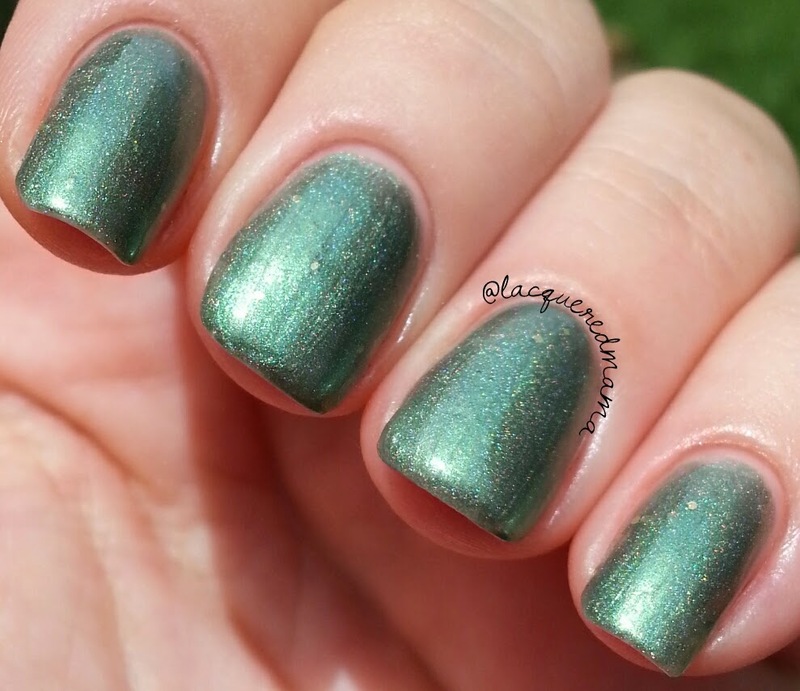 This is another color that is really great for summer! 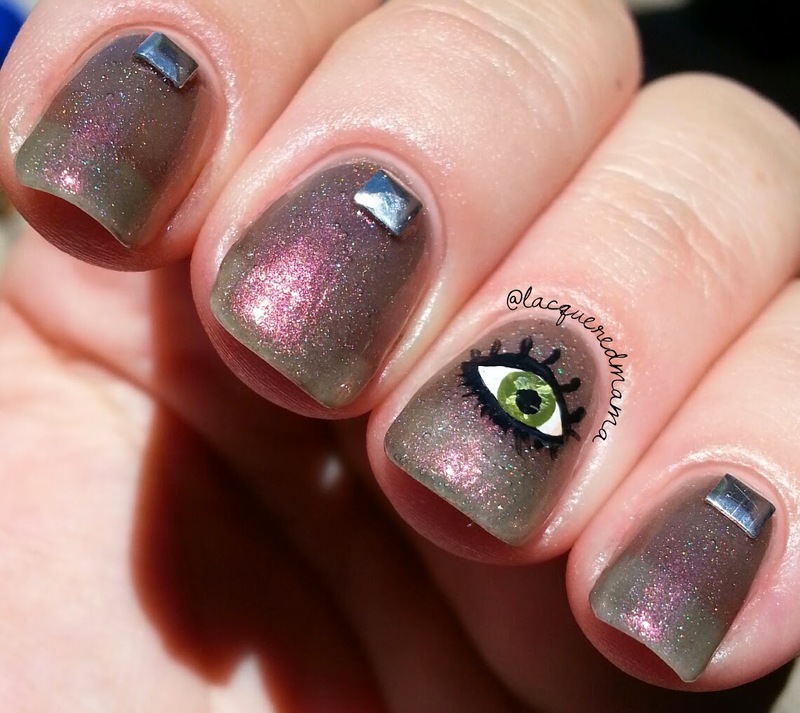 Nice and bright, shimmery and glittery! 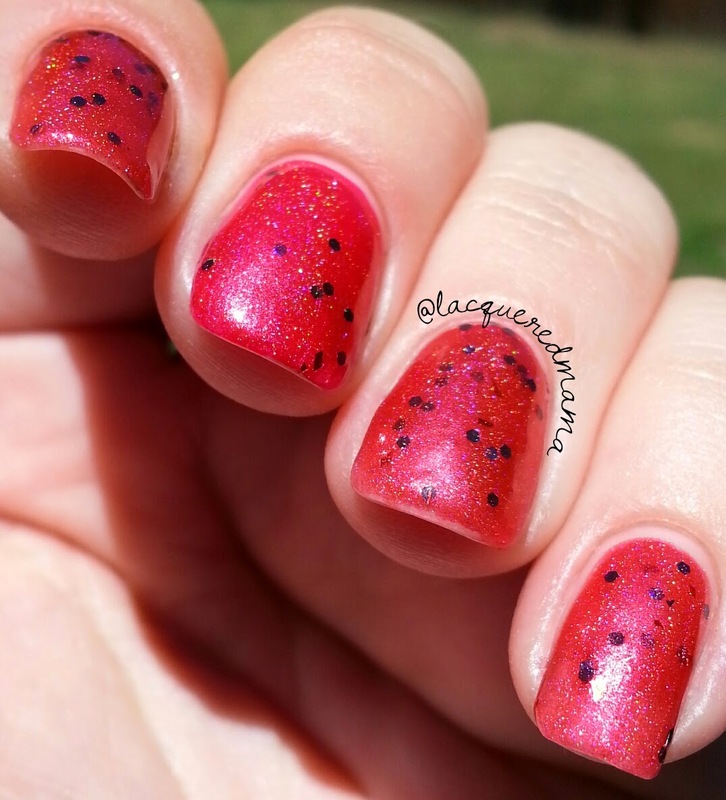 I opted to pair it with some neon pink studs and nailart. I love the way the colors look together! The last polish I have in the OITNB collection is Religious Nut. 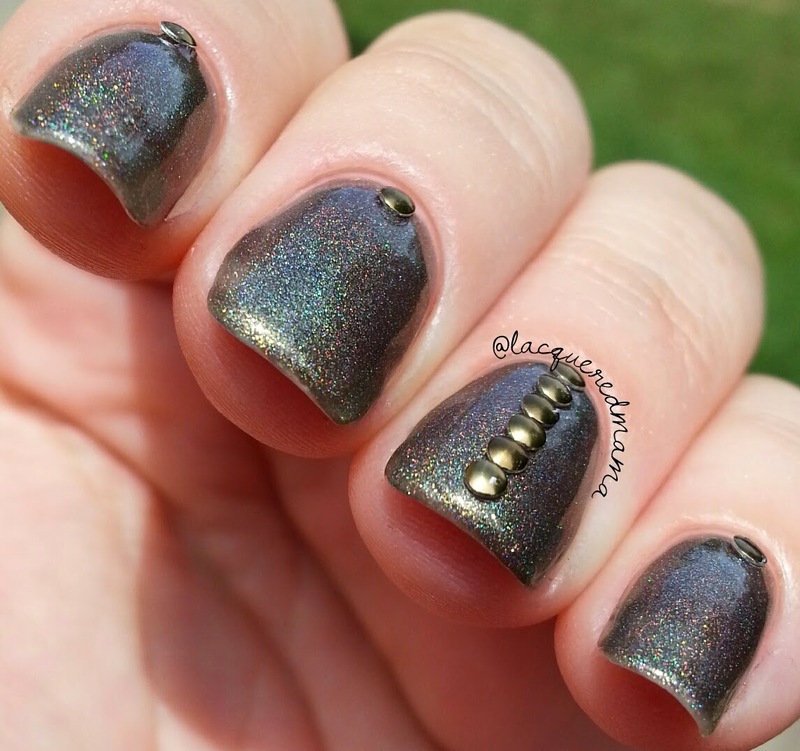 It has a blackened jelly base with green glitter and linear holo. 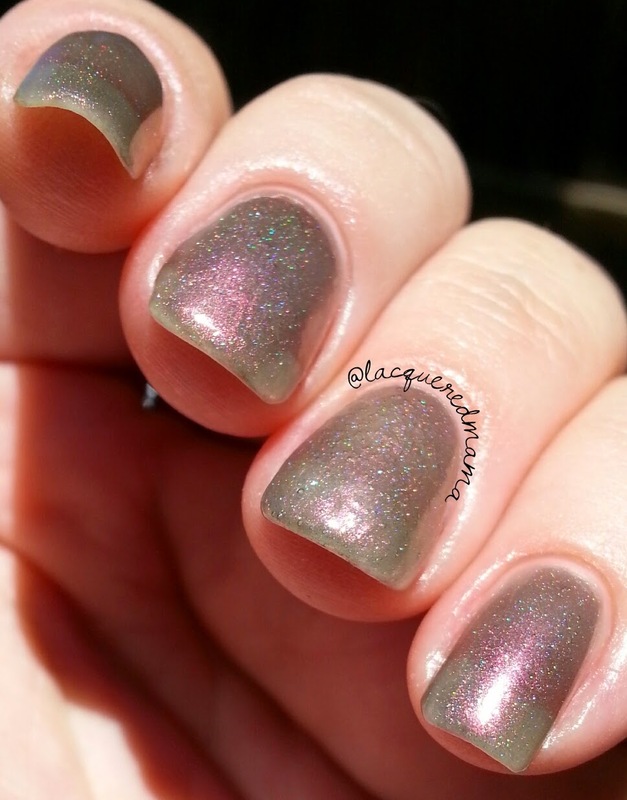 This one is beautiful and really showcases that holo in the sunlight. As you can see my basic swatches weren't taken in complete sunlight, as it was slightly overcast. By the time I went in and added my Winstonia studs, the sun had come out and you can really appreciate that holo rainbow much better! In my pictures I did 3 coats plus topcoat. 3 Wishes in a Lamp is from Danielle's Make Believe collection. 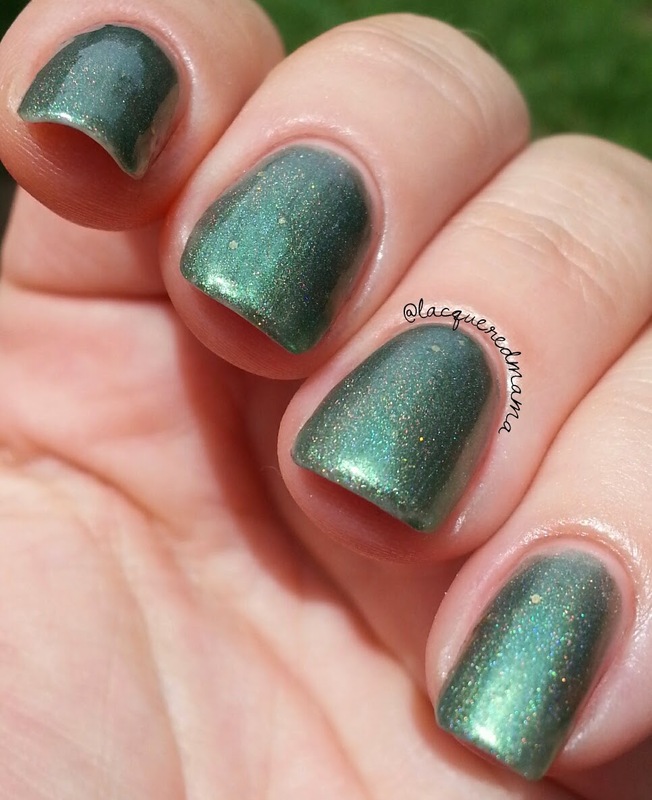 It is a lovely green with linear holo sparkle and flecks of golden glitter. 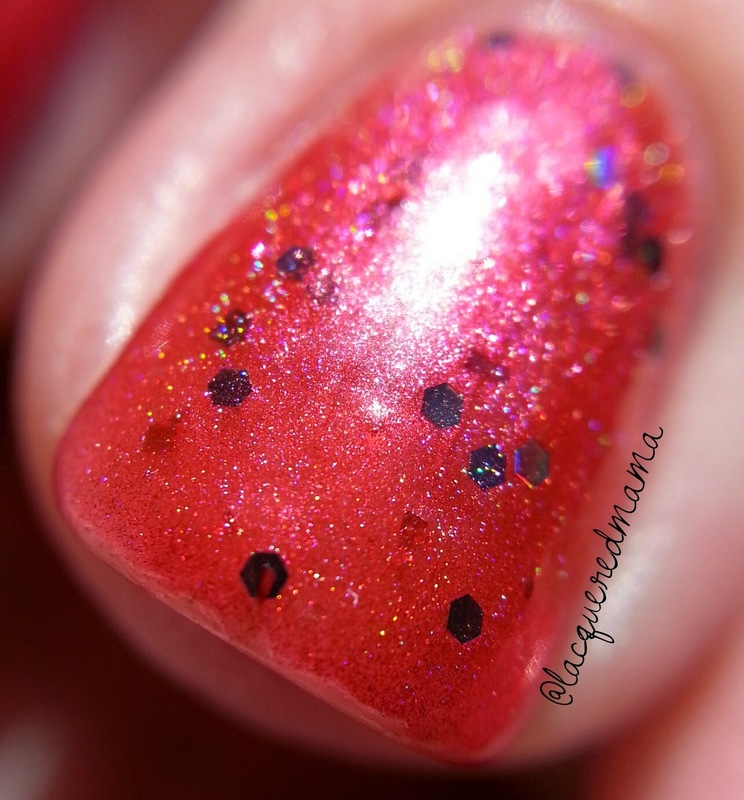 This one had the best formula of all the polishes and only took 2 coats to obtain complete opacity. 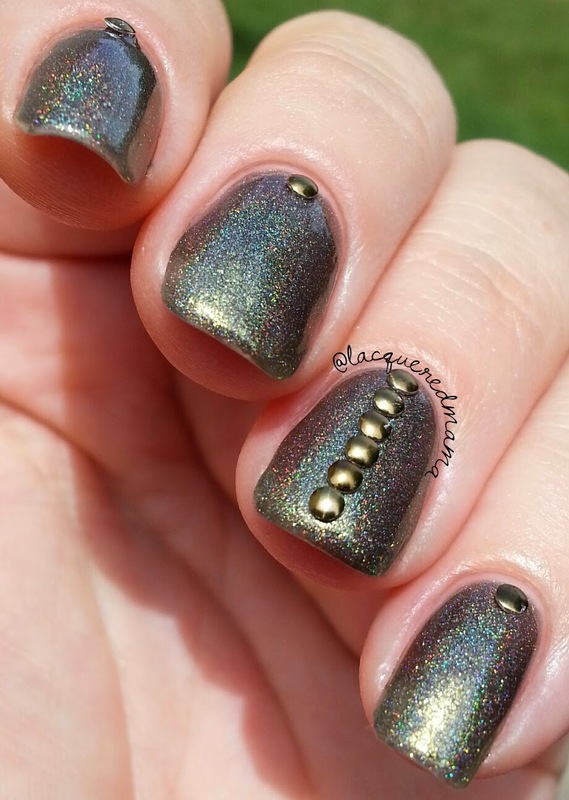 I really loved the little touches of gold that catch your eye in this one! I decided not to cover this with any nail art. So overall I was really pleased with all the polishes I purchased. 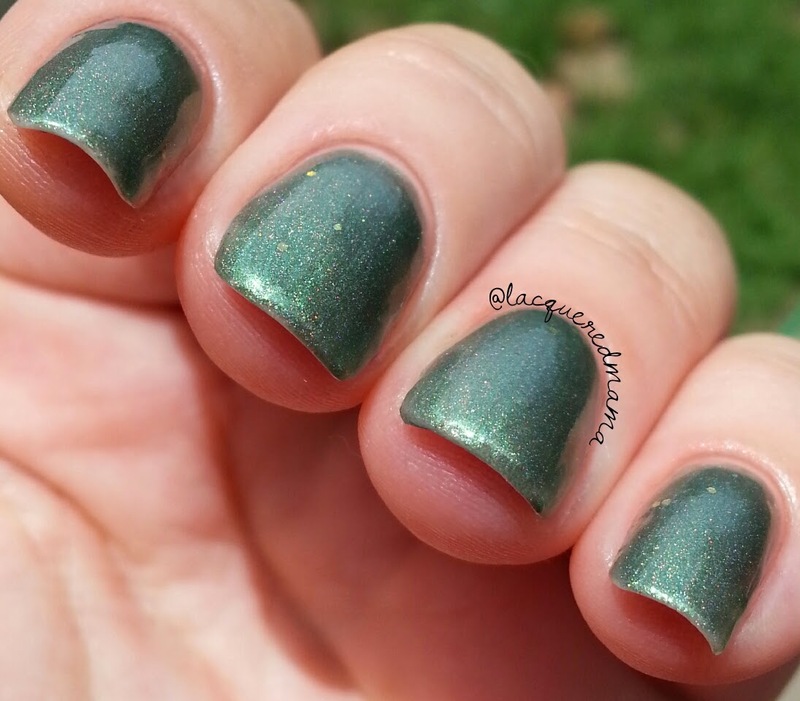 4/5 are opaque in 3 coats or less. 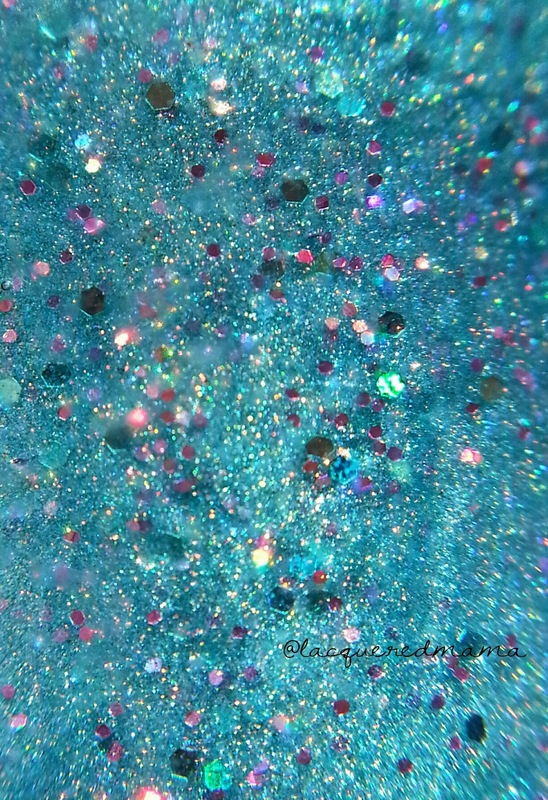 The colors are all beautiful and really sparkle in the sunlight. The only downside I had with any of these was the shipping time. I ordered the polishes on 06/05/14 and didn't receive them until 6/20/14 and I never received any notices stating when they were actually shipped. I'd say they were worth the wait, but hope that future orders would be processed a little quicker and that I'd be notified when they go out. I think most buyers in general would rather pay a little more for shipping with tracking. 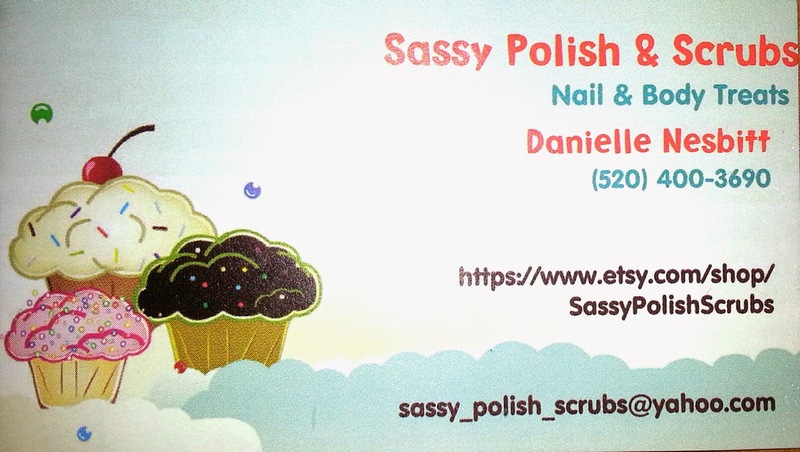 With all that being said I'd give Sassy Polish and Scrubs a thumbs up and say...4 out of 5 stars. They just need to better their communication and shipping time, as well as a little more organization within their etsy shop. They appear to have a lot of polish options and I found it hard to differentiate collections a little.They are a new brand, so I'm sure it takes a bit of trial and error before really getting into a groove. Congrats on your new venture Danielle! Can't wair to see what you come up with next.